Otto Muehl has probed psychosexual politics through art for over half a century, yet it is only now, at the age of eighty, that the Austrian artist is presenting his United States solo debut. Gathered from the Friedrichshof Collection and the Otto Muehl Archive in Paris, the gallery offers a small selection of the Viennese Actionist’s more puritanical paintings as well as three films by Kurt Kren that document Muehl’s elaborate and scatological performances. Marking Muehl’s turn against figuration in the late ’80s, ten abstract canvases display refined material surfaces while retaining the traces of a cruder actionism. Dark Tumult, 1988, is a dense topography of black oil paint and rags that burst past the work’s edges, only to be confined by the four sides of a wooden shipping crate. 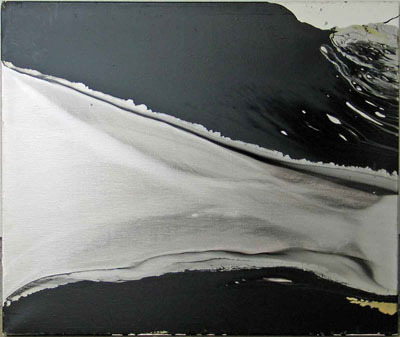 Amongst the combines of hay, ash, dirt, and sand are two untitled works composed of chromelike metallic fluid discharged over a slick, asphalt plane. But the exhibition is not without the fecund humor (and humors) one expects of Muehl. Three smaller canvases, all dated 2002, return to the use of excrement as absurdist commentary. Most notable is Austrian Egg-dropper, a satirical caricature of a nationalistic man who, glancing towards the viewer, squats to expel broken eggshells and splattered yolk. Here, Muehl keenly sums up the pathos of production in an oppressive state.